It was a busy season for Esri regional user conferences (UCs). This year, all four regional UCs were held within eight weeks of one another. 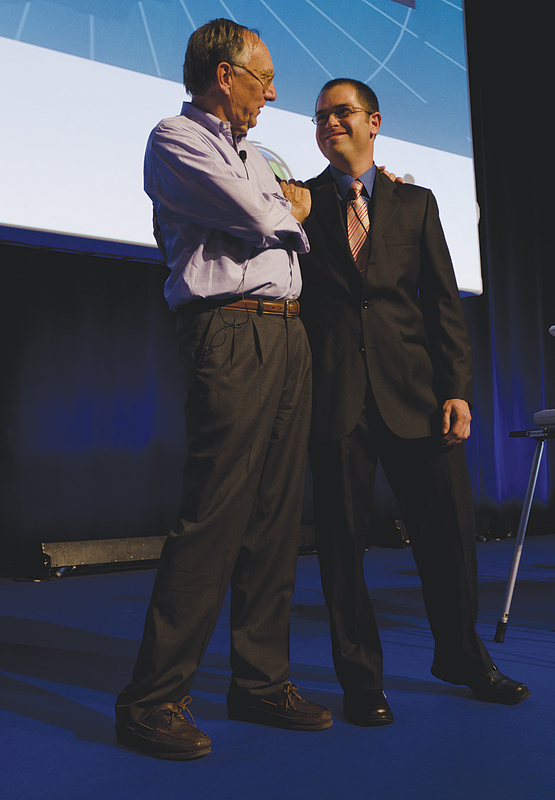 Esri's Jack Dangermond and Andres Muñoz present a demo at the European User Conference in Madrid. Each of these regional UCs provided an opportunity for users in a particular corner of the world to learn about the latest updates, share ideas and best practices, and network with other users in their position or industry. "We appreciate seeing each and every one of our users at their regional conferences," says Esri president and cofounder Jack Dangermond. "These conferences are a great complement to the Esri International User Conference each year. Many of the new concepts presented in San Diego are practically applied in a smaller setting at these regional UCs. I enjoy meeting familiar and new faces each fall at the conferences." The 2011 Esri Latin America User Conference (LAUC) was held September 28–30 in San Jose, Costa Rica, a country known for its pursuit of sustainable development of, respect for, and preservation of the environment. Hosted by Geotecnologías S.A., Esri's international distributor in Costa Rica, this conference provided many opportunities for the more than 550 attendees from 19 Latin American countries to learn about GIS alongside their peers and industry leaders. The central theme was "Geomatics Applied to a Green World," which led to the presentation of more than 40 papers in many subjects that approached the issues of mapping, disaster prevention and mitigation, surveying, sustainable forestry, mining, and urban planning, among others, throughout Latin America. The Latin American Award for Excellence in GIS was awarded to six different organizations from the region. Instituto Costarricense de Electricidad (Costa Rica) received the award for implementing a multiuser GIS that operates at a national level. Additional recipients included Agip Oil Ecuador (Ecuador), Departamento de Indicadores (Panama), Instituto Geográfico Militar (Chile), PERU LNG SRL (Peru), and Transmilenio S.A. (Colombia). The conference also showcased the work of a young student, Maria Paula, who gave a presentation on how ArcGIS is used to analyze solutions to mitigate waste, preserve the environment, and improve the quality of life of the Osa Peninsula in southern Costa Rica. "The recent LAUC was a resounding success if judged by the large number of participants and the high quality of presentations by users," says Merrill Lyew, international regional manager, Latin America. "The variety of workshops, seminars, and minitheater technical conference sessions before and during the conference was impressive, as was attendance at the meetings, which were always at capacity." Further post-LAUC information can be found at geotecnologias.com/lauc2011. Save the date for the 2012 LAUC, to be held October 31–November 1 in Buenos Aires, Argentina. Users enjoy the Plenary Session at the Latin America User Conference. More than 3,000 attendees from 60 countries around the world, including at least 33 European nations, saw each other in Madrid, Spain, as Esri España, Esri's international distributor in Spain, hosted the 2011 European User Conference (EUC) October 26–28. This was the largest-attended Esri regional UC in history. Attendees were treated to a wealth of information, as well as unique opportunities to sample Spanish culture. "It was an honor for Esri España to host the greatest GIS event in Europe," says Alfonso Rubio, managing director of the distributor. "More than 3,000 GIS specialists from many different European countries shared their experiences to improve skills and the art of geographic knowledge. Esri España thanks all who attended." Special preconference seminars brought developers from Esri to collaborate with users on how to build applications with ArcGIS Runtime, work with Esri CityEngine, give professors a way to leverage web GIS, and more. More than 120 papers, representing users and partners from 18 different industries, were presented at the EUC. There were also more than 30 companies exhibiting, including platinum sponsors HP, IBM, and Microsoft. Entrepreneurs aiming to enhance their projects and ideas with GIS were treated to a special track during the technical workshops to learn how their businesses can benefit from using ArcGIS. Attendees enjoyed a special gala celebrating 20 years of Esri España at the historic Palacio del Negralejo. The Fiesta del GIS treated guests to a traditional Spanish feast fit for a king and included music and flamenco dancing. Conference proceedings are available by visiting esri.com/euc. The 2012 Esri European User Conference will be held October 15–17 at Oslo Kongressenter in Oslo, Norway. This year's Esri Middle East and Africa User Conference (MEAUC), held in Beirut, Lebanon, and hosted by Esri international distributor Esri Lebanon sal, attracted more than 500 GIS professionals from 21 countries in the Middle East, Africa, Europe, and Asia to connect, collaborate on, and create solutions in the GIS space. Two industry-intensive tracks—one in defense and one in utilities—were offered for attendees to enrich their GIS experience and understand GIS trends in their specific industries. "This regional event for users of Esri technology facilitated the coming together of GIS users, developers, hardware vendors, and solution providers from across the region to listen to and exchange ideas, knowledge, and experiences," says Philip Burden, CEO of Esri Lebanon. 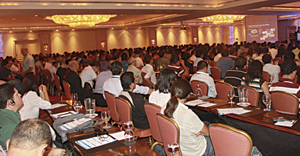 "On behalf of Esri Lebanon, I'd like to send a thank-you to all the attendees at the 2011 MEAUC in Beirut." Several awards were given out over the course of the events, including awards to each of the paper presenters. In addition, Best Map in the Map Gallery was awarded to the Lebanese Army (Lebanon), and the Top Paper Award went to Dr. Chadi Abdallah, researcher at National Council of Remote Sensing, Lebanon. "I want to congratulate the Esri Lebanon team on this successful event. It was well organized and managed, and I was impressed by many ideas in it," says Zeina Bathich from the Chamber of Commerce, Industry and Agriculture in Saida and South Lebanon. The exhibition also attracted attendees to the booths of 33 exhibitors from around the globe. For more postconference information, visit esri.com/meauc. The 2012 Esri Middle East and Africa User Conference will be held in the United Arab Emirates; the date and venue are to be determined. Visit the Esri Events page for the most updated information. The Seventh Annual Esri Asia Pacific User Conference (APUC) was held November 15–16, 2011, in Seoul, Korea. Hosted by Esri Korea, Inc., Esri's international distributor in that country, the APUC welcomed more than 1,500 attendees from 19 countries around the world. With content focused on cloud computing, sessions at the APUC engaged users and brought their GIS thinking into the cloud. "We were very excited about the high level of enthusiasm showed by the participants—such active participation and growing interest in GIS," says Jay Yoon, president of Esri Korea. "The seventh Asia Pacific User Conference offered a great opportunity for attendees across the Asia-Pacific region to extend their networks and learn how others are using location intelligence in innovative ways." The Special Achievement in GIS Award was given to two organizations—Gwangju City for its City GIS project, which improves administration and citizen engagement within the city, and the Korea Rural Community Corporation for the Rural Agricultural Water Resource Information System, which provides professional management of water resources. Wan-young Song, manager of Daewon Aerial Survey, says, "I'd been looking forward to attending the conference. It's wonderful that Asia-Pacific distributors and international users come together and network and share their visions and ideas [in Seoul]. It was impressive to hear Jack's presentation in person, as well as presentations from Esri's technical staff. I also participated in the Map Gallery and took first place. So honorable!" Proceedings will be available mid-December to early January by visiting esri.com/apuc. As of this printing, the date and location of the 2012 APUC have not yet been determined. Visit the Esri Events page for the most up-to-date information.